CY92MG: 2 Homes with pool on 80 acres near Santa Elena/San Igancio, Cayo District! 2 Homes with pool on 80 acres in Santa Elena, Cayo District! Home for Sale in Cayo Belize! Home Real Estate in Cayo for sale! A Modern Belize Finca consists of a main-house, guesthouse, unfinished 2nd guesthouse and a pool with entertainment bar – all on a 80 acre property. As you enter through the gates you will find special & unique features designed and built by the creative and artistic couple. The fenced perimeter area is over an acre and is planted in many ornamental plants and shrubs. There is a gravel covered parking space for 5 cars. 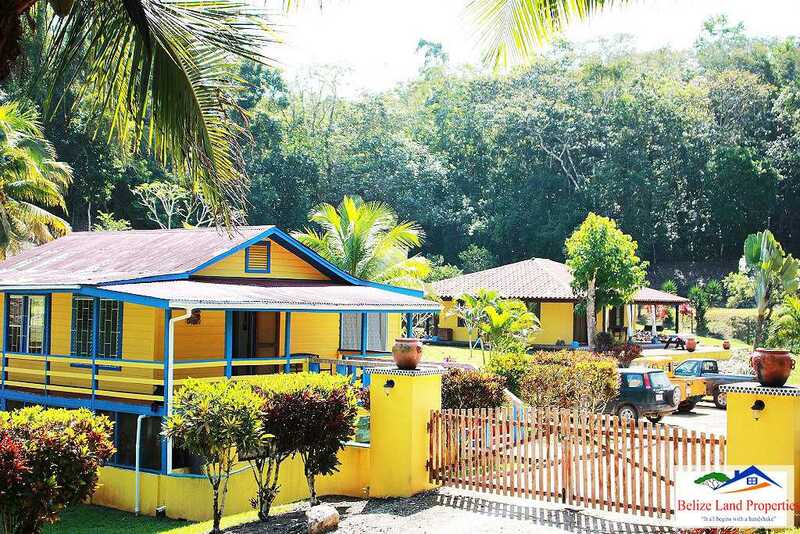 This gorgeous property boasts a tranquil and private setting and is ideally located just 2 miles from the popular tourist town of San Ignacio. A quick 10 minute drive gets you downtown with many conveniences and amenities. Get away from the hustle and bustle to enjoy a serene and quiet atmosphere created and provided by the lush vegetation surrounding this hidden gem. The main-house offers over 800 sq. ft. of living space and comes with an open concept living, kitchen and bedroom. It features hardwood vaulted ceilings and comes with a tiled en-suite full bathroom. The kitchen features a simple but functional design equipped with major appliances including a stove, fridge, microwave & dishwasher. This main-house has a covered wrap-around porch with a panoramic view of the swimming pool, guesthouse and main gate entrance. The guest-house has over 700 sq. ft. of living space and is one of the original structures built on stilts and made of solid Belize hardwoods. This cute guest-house is meticulously taken care of and comes with 2 bedrooms, full bathroom, living space & kitchenette. It also features 2 door entrances and a porch on 3 sides. The lower part of this structure is used as a storage room for lawn equipment, tools and laundry. The 2nd guesthouse is unfinished but would be a great addition to this finca that would allow for an opportunity to have another guest-house for family, friends or for a bed-breakfast operation. A home-site for building a future home was carefully selected and prepared by the couple. This elevated and solid ground is the excellent location for a home to be built by the new owners with a great view of the other homes and the pool. This site has electric and water already delivered to it. The pool and entertainment lounge are a true highlight and is a perfect place to unwind and relax after a busy day. Or simply take laps in the swimming pool and when done, walk up to the bar to enjoy a cold beer or tropical cocktail. With the spacious seating area, its a great place to host a party, entertain guests or simply for some alone time. This low maintenance swimming pool is 4 feet deep and is equipped with a properly fitted pump and filter system. It even comes with a cleaning robot. Of the 80 acres of land, about 1.5 acres are used for the homes and approximately 8 acres are planted in numerous fruit trees such as: coconuts, mangoes, avocados, plums, bananas, oranges, limes, guava and several teak trees. The remainder of the property is in its natural state with large shade trees throughout. Property boundaries are kept clear making it ideal for nature walks or hikes. There is plenty of room for more fruit tree planting, an organic garden or hobby animal farm. There are many great things going for this property, including: its location, on the grid with electric, private 300 ft. deep water well, 80 acre jungle property, established structures, fruit orchard and low property taxes, just to name a few. This places makes for a wonderful retirement home, private family estate or for an income producing opportunity such as a resort or bed & breakfast. The opportunities are endless especially with its location and the close proximity to the natural and tourist attractions in the area. Some furniture and equipment included in the sale. See below for some details and features. << T1: 20 acres beachfront Property south of Monkey River!